On the same road there is a crossroad a just before Agios Thalaleos and the left hand fork leads to Melanes, a village built in one of the most lush, green valley’s on the island, where the running water was used to set in motion the now deserted water mills. Near Melanes, at Flerio, there is another half finished statue of a kouros which has been left lying in an ol­ive grove, just in the place where the ancient sculptors left it. 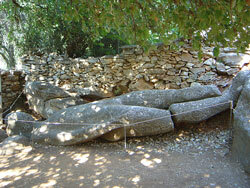 It dates to the 7th century BC, and is one of the best known statues of its kind in Naxos. Continuing the road comes to Kinidaros, a village famous for its animal products and built on a rocky hillside, at the height of 400m. It is said that its inhabitants are «descendants of a race of musicians and dancers». In the summertime evening festivals are often held in the village taverns featuring live music. 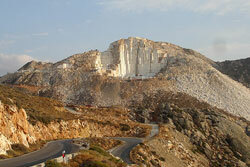 In this area there are marble quarries. 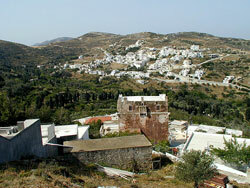 After Kinidaros the road leads to Stavros Keramotis where it joins up with the central main road.